The first time I tried this risotto I was skeptical – very skeptical. How could you get mushroom flavor without dried porchinis or without browning the fresh mushrooms? Why does it seem like too much alcohol and not enough stock? I decided to throw caution to the wind and make only quantity changes, rather than change the method entirely. Well, the mascarpone is me but that’s not major. The verdict: it has all of the mushroom flavor you want and it’s the best mushroom risotto I’ve had. Period. Make this, and you won’t be sorry. (Or maybe you will because you’ll want to over eat.) Serves 4. Add the stock to a small pot, bring to a boil. Once boiling, reduce heat to low and cover until needed. In a bowl (or 2-cup measuring cup), add the sherry and wine; set aside. Meanwhile, in a heavy-bottomed pan over medium heat, add the oil, butter, shallots, and garlic. Stir for a couple of minutes until translucent, but not brown. Add the rice, stir to coat in oil, and toast for about 2 minutes. Add the mushrooms, stirring to coat for about 3-4 minutes. Begin by adding half of the sherry/wine mixture, stirring until absorbed – then add the remainder, stirring until absorbed. Then begin by adding the stock one ladle at a time, waiting until it is absorbed before adding the next. Once the risotto is tender throughout, remove it from the heat and stir in the cheeses until melted. Taste, and season with salt and pepper. 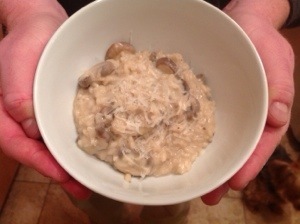 Once your stock is about 3/4 gone, taste the risotto to check from doneness because you may not need it all. Even though everything you read about risotto is to stir constantly – resist the urge. You really can walk away from the pot for a minute without stirring. I would guess that I stir about 75% of the cook time. * Mascarpone cheese is an Italian cream cheese – it is mild and creamy. If you are having trouble finding it, try an Italian specialty store. If you just don’t want to track it down, use 1/4 cup of heavy cream.